Seeking the Savanna instead of Seas: "Saturday Night Live" and Geology?? Historical geology is a real head trip (remember that term?). Stick geologists in the desert against a cliff like the one above, and they will make a few observations, pick up a few stones (and/or fossils), and in their mind's eye, they will be exploring a long-ago prairie that would have looked much like the one in the picture below (a bit of the rarest ecosystem in California, the prairie at Merced National Wildlife Refuge). There would be differences of course. This current-day prairie is populated by a diverse group of birds and small mammals like ground squirrels and rabbits. But it lacks some of the components of a healthy modern wild prairie, mainly the larger grazing animals like deer, antelope, and bison, and the large carnivores that would prey on them. Coyotes and foxes still inhabit the region, and cattle or sheep are sometimes brought onto the prairie to help maintain the quality of the grasslands. But the larger canines and cats, i.e. the wolves and the lions, are long gone, as are the bears. We were on the first full day of our exploration of Death Valley National Park. We weren't there yet, because we had a hundred miles of Mojave Desert to cross before we reached the park. Along the way we made a stop at one of California's most spectacular state parks, Red Rock Canyon (not to be confused with the Red Rock Canyon National Conservation Area outside of Las Vegas). Red Rock Canyon is on Highway 14 between the town of Mojave and Lone Pine, southeast of the Sierra Nevada. The place will look familiar to many, as the striking red and white cliffs have formed the backdrop to dozens if not hundreds of Hollywood movies (including some the opening scenes of the original Jurassic Park). The plain hills to the south of our parking area (in the picture above) are composed of Paleozoic and older metamorphic rocks that have been displaced and uplifted along the Garlock Fault just south of the park. The rocks have been moved some forty miles from their original location by the left lateral movements of the fault zone. 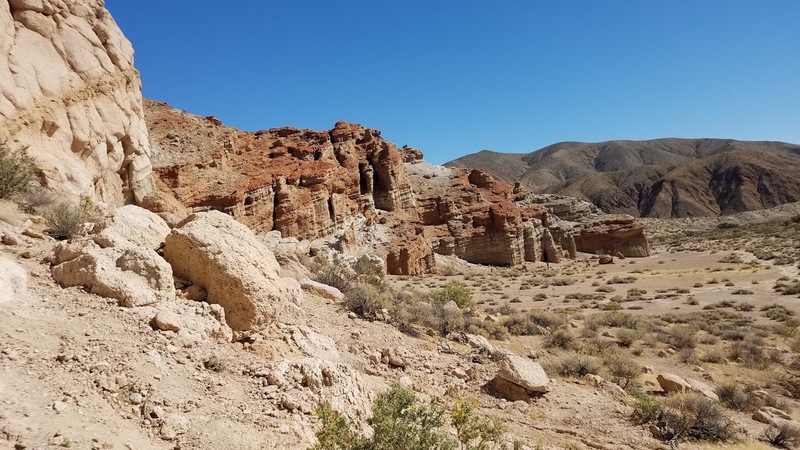 They have their own fascinating story, but what catches the eye are the much more colorful sedimentary layers that were deposited on the eroded surface of the metamorphic rocks between about 8 and 12.5 million years ago, a time period called the Miocene epoch. For many of our students, this is the first real-world example of the basic principles of stratigraphy. We spent a few minutes talking about the birth of the science of geology in the observations of Nicolas Steno (superposition, lateral continuity, and original horizontality), and James Hutton (uniformitarianism). Then I unleashed them onto the rock exposures so they could evaluate the origins of the rocks and the sequence of events that produced the spectacular cliffs in front of us. Understanding the changes of a prairie ecosystem through time is as easy as understanding "Saturday Night Live" (which for a fact might not be that easy). For more than forty years the underlying structure of the show has remained much the same; there's a guest host, there is a cold open ("It's Saturday Night! "), there are skits, there is the weekend news, there are fake ads, there are musical numbers. But cast is constantly in flux. There have been many people over the years who have filled in the niches: those who could mimic political figures, those who could act as the "straight man/woman", those who could sing. Sometimes the actors were so unmemorable that they disappeared without a trace after a few weeks or months. Others were successful, and remained for years. Others went on to greater things, like Hollywood movies. And that's how the prairie savanna has worked over the years. Once our students have looked closely at the rocks, they've identified that there are fine layers representing deposition in lakes, other layers that formed on floodplains or alluvial fans. The terrestrial origin of many of the layers is supported by the bright red color, formed as iron in the rocks oxidized into natural rust. What we don't have time for (or permission for that matter) is a search for fossils, because it is the fossils that tell the fullest story of these rocks. Are these fossils the John Belushi-Dan Akroyd period of the grasslands? Or the Joe Piscopo-Eddie Murphy period? Or Kate McKinnon? Grasses emerged as a dominant plant species in the middle of the Cenozoic period around 30-35 million years ago. The low-lying plants had a novel method of survival: instead of broad leaves easily chewed by forest-dwelling animals, the blades of grass incorporated silica into their structure, and the hard silica would soon destroy the teeth of most animals that tried to subsist on it. A general warming and drying of the world climate led to the expansion of the grasses at the expense of woodlands and tropical rainforests. Animals either adapted to the new conditions or went extinct. The early part of the Oligocene and early Miocene saw many changing species, especially in the horse clan. The ancestors of the horses were small browsers in the forests. As they adapted to the open grasslands, they became larger, and their feet went from three or four toes to hooves, which gave them great speed to escape predators. Their teeth evolved to grow throughout life, allowing them to survive nicely while grazing the grasslands. 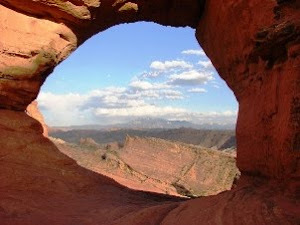 The fossil-bearing rocks at Red Canyon are called the Dove Spring Formation (formerly the Ricardo Formation). The cast of characters are familiar in the sense that they fill the roles of many species on the prairies and wetlands today, but there were some unfamiliar characters as well. More than a hundred species of plants and animals have been found, making this one of the richest and most diverse fossil assemblages in the American West. They include the smallest mammalian members of the ecosystem such as mice, ground squirrels, rabbits and even a pika. The larger grazers were represented by ten (yes, ten) species of horse (compared to the three existing in the present day), four camel species, and three species of antelope. There were the surprising ones, two rhinoceros species, and two elephant ancestors (gomphotherium). The carnivores are represented by eight species of canine ancestors (some are called the "bone-crushing dogs"), and three species of felids (cats), including an early saber-tooth. There is a fair candidate for the ancestor of bears and dogs called a "bear dog" (Amphicyon). For a complete listing of the fossils found at Red Rock, check out this technical report from 2009. So our investigation of an ancient savanna prairie revealed some of the early players in the drama that has played out across North America over millions of years. Some of the players (genera) were diverse and widespread but ultimately died out in North America (the horses and camels, rhinos and elephants). Other lineages survived, including the deer, the pronghorns, and predators like the wolves, coyotes, mountain lions, and foxes. The bears still lurk nearby in the mountains and would no doubt reoccupy the grasslands if the farms disappeared. Like "Saturday Night Live", the show continues and hasn't suffered cancellation, but a great many changes have taken place. The prairies of 12 million years ago can still be found in California today, but with a new cast and a different look. The world changes. It changes minute by minute as events happen in human society, the disasters, the eruptions (such as Sinabung this last weekend), the wildfires, the earthquakes. Other changes are more incremental, such as the rise of mountain ranges and their removal by the relentless forces of erosion. Given enough time, huge changes take place, but no one in the midst of these processes would ever notice a difference over the course of their lives. Teaching geology and the earth sciences is often a challenge, especially when we talk about the history of planet Earth. The rocks on the slopes before us may look barren and innocuous, but huge events reveal themselves when we start observing them carefully. As a professor at a community college, my students are usually neophytes in the geological sciences. They are seeing the earth from a new never-before considered viewpoint. I was on the road this last holiday weekend, introducing my students to the geology of Death Valley National Park. Some are currently in geology classes, some already had taken my courses, and some were entirely new to the science. Death Valley is a long drive from our campus, so we left on Thursday night to cover the 200 miles of the flat Great Valley, and to get a head start towards the desert. We camped at Kern River County Park outside of the town of Bakersfield, and at the foot of the southern Sierra Nevada. After a cold night, we awoke to a panorama of barren grass covered hills with no rocks in sight. A layer of soil covers them all, except where roadcuts expose a small part. We talked in camp before leaving about how geologists see landscapes. Where a politician might see only city and county boundaries, geologists see provinces, regions with a unique geological history that contrasts with the areas around them. The Great Valley of California, for instance, is a vast 400 mile long trough that has been collecting eroded sediments from the Sierra Nevada and Coast Ranges. It's been going on for at least 140 million years, and the sediments have accumulated to depths as great as 50,000 feet. More recently, perhaps during only the last one or two million years, the land was uplifted and gently tilted, causing the sediments to start eroding again. We further talked about how geologists organize the rocks they see into formations, members, and groups. We recognize that in specific environments (ocean bottom, river floodplain, delta, sand dune) specific kinds of rocks will accumulate, and we can recognize by a change in the rock that the environment changed at some time in the past. In other words, as one looks at a cliff, different layers with different rocks and different colors show how the depositional environment changed, such as a river flood plain being inundated by rising sea level, or becoming drier and changing to a desert with dunes and the like. These unique layers are called formations. Formations are distinguished by being mappable and by having precise definable contacts with other layers above and below. Thinner distinctive layers within a formation may be defined as members, while several closely related formations (such as desert dry lake salt layers and desert sand dune deposits formed adjacent to each other at about the same time) may be classed as a group. At our locality along the Kern River, a shallow seaway once existed. Maybe that's not such a stretch, since a rise of sea level of only 300 feet would inundate the area again. The presence of the sea is indicated by silt and sandstone layers, and the presence of numerous fossils. 15-16 million years ago, in the Miocene epoch, this was an ocean teeming with life. The shoreline must have been relatively close by because the fossil assemblage includes an occasional bone of a horse or camel, indicating a carcass that floated out to sea after a flooded river overtook the animal. The animals preserved as fossils are whales, dolphins, seals, walrus relatives, manatee relatives, and more than two dozen species of shark. Sharks have rarely-preserved cartilage skeletons, but their teeth are species distinctive. The size of the teeth range from barely visible to monstrous daggers almost a foot long (from the gigantic Great White relative Megalodon). The rock layer is called the Round Mountain Silt, a formation within the Temblor Group. The incredible accumulation of fossils at the locality has been something of a mystery; suggestions include a volcanic ash disaster (no evidence of volcanism nearby, though), red tide poisoning (perhaps, but no clear evidence), or a feeding ground of large sharks (but large sharks were among the dead as well). 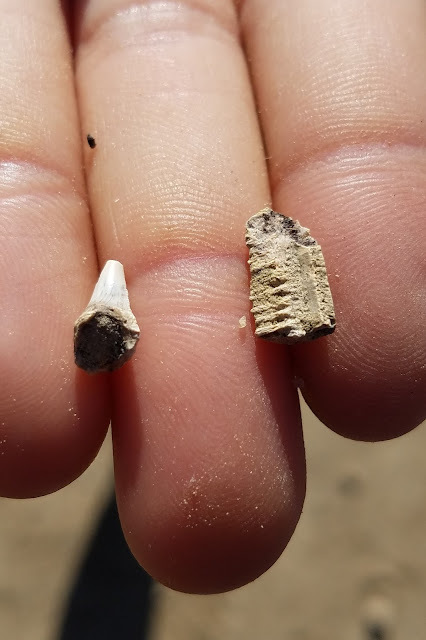 A more recent suggestion is that the bones and teeth accumulated over a long period of time (perhaps 700,000 years) at the bottom of a sediment-starved basin (a deep trough a little farther offshore; such basins exist today in Southern California around the Channel Islands). Whatever the reason, the idea of finding fossils for the first time in their lives held great appeal for the students! 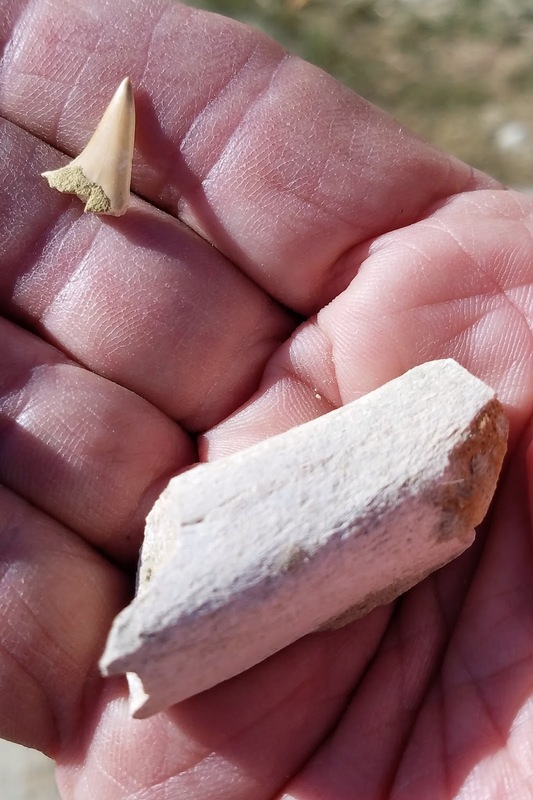 They shot off up the hill and although finds weren't abundant, almost everyone found a fragment of bone or a small tooth. The strange rectangular tooth in the picture above was that of a manta-type ray. It's clear that some people spend a great deal of time digging and collecting at the site (the hillside has a prominent ledge where the digging takes place. Two years ago, one of the "serious" diggers was there, and showed us one of his really excellent finds, seen below. 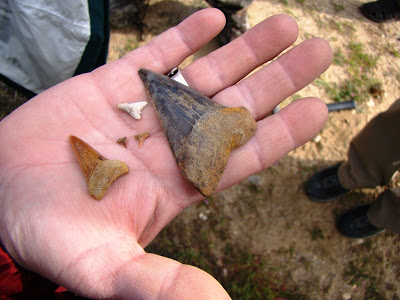 The largest tooth ever found by any of my students was probably this one from 2011 (below). The variety in shape and size is apparent from the selection seen in the photo. One warning about hunting for fossils in the region. The south end of the Great Valley is prime habitat for the fungal spores that cause Valley Fever. It's a nasty disease that is caused when the spores (which are in the dusty soils) get into your lungs and reproduce. If you ever give it a shot, take precautions...it's not a disease to be trifled with. We got in the vans and started over the hill (Tehachapi Pass) on our way to the Mojave Desert, and then onwards to Death Valley, where our explorations would really begin. Geotripper Missing in Action? Nah, Just on the Road. If you've noticed a distinct lack of blog updates lately, it's not been for lack of creative ideas. I've actually been in the wild hinterlands of the eastern California desert, specifically Death Valley. We had a marvelous time, but we also experienced a bit of the harshness of the "Broken Land" as Frank DeCourten calls it. There's a bit more cellular and Wi-Fi access in recent years for better or worse, (better for emergency situations), but no time when dealing with a group of students (who were great). Besides, a desert night is meant to be experienced, not ignored in favor of a computer screen. The stars were beyond belief. In any case, the stories will unfold in the next few blogs. There were some incredible sights, and I look forward to sharing them. 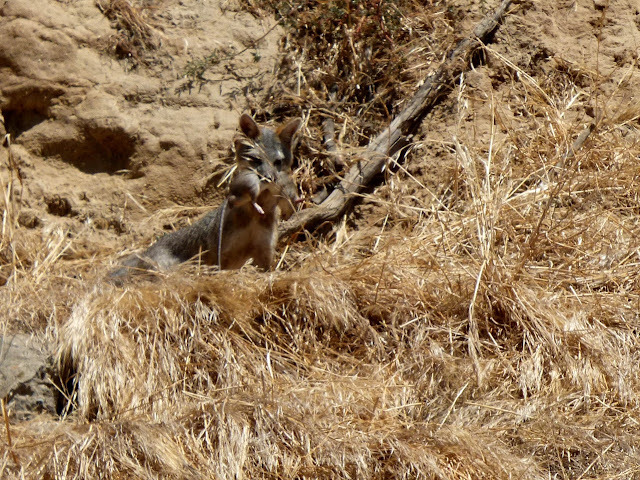 Today's picture was a camp visitor on our first night of the trip on the Kern River near Bakersfield. I admit it. I miss a lot. I've noticed that a lot of colleges and universities are very proud of their history and traditions, but in my experience at three community colleges, the memory of a department is rather short. When I started at Modesto Junior College, I was told stories of my predecessor, who was a legendary character, and not in a good way. Although he served for many years, his retirement was welcomed by many. It took a number of years before I found that some rather significant people taught in the position I occupy now, including Richard Hilton, who wrote Dinosaurs and Other Mesozoic Reptiles of California. Another was Charles Love, the son of Wyoming geologist David Love, whose career was central part of John McPhee's excellent book Rising From the Plains. But those individuals only reach back into the 1970s. I've got no idea who was here in the first fifty years of the existence of our institution. Likewise, I know very little about the first college I attended, Chaffey College in southern California. It's true that I was just a gawky teenager who had no sense of institutional history when I was there between 1975 and 1977. I got to know my two professors, but they were relatively young at the time, and I had no sense at all of who taught there in earlier years. So I had a series of interesting revelations tonight. I had known that my step-grandfather had taken a geology class way back in 1930, and it turned out that he held on to some of his notes (present-day students of mine: do YOU do that??). They were passed on to me, and I set them aside and they were "lost" for a time when we had to pack up the entire house for a re-carpeting job (yes, this is obviously a convoluted story). In any case I ran across the notebook again and finally decided to sit down and have a closer look. The first surprise had nothing to do with the geology. I'm sure I was told this but it just didn't register: my grandfather went to the same community college I did! At the time it was called Chaffey Junior College (today it is simply Chaffey College). That "junior" conferred a sort of inferiority upon the students who needed to attend a cheaper local alternative to expensive universities and private institutions. But if there is anything that I've found to be true, it is that we community colleges produce a great many talented graduates who have competed very well when they've transferred to four-year institutions. Still, over the years, California's community colleges have dropped the "junior" from their name...all but two: Santa Rosa Junior College, and my very own Modesto Junior College. We decided a long time ago that we liked our name. Our students provide us all the reputation for excellence that we need. As I opened the lab book (which hasn't changed form in nearly 90 years), a slip of paper fell out. It was his report card. What was great interest to me was that the geology instructor had signed his name, R.D. Dysart. I had found the name of a geology instructor from those early years of Chaffey's history. So I got curious and started searching on the internet for any information about the man (and how unfortunate it is that I immediately and correctly assumed that it was a man?). And with that came the second big surprise. I got my bachelor degree in geology from Pomona College, an achievement for which I am very proud (I'm not saying I excelled; I made it through the program...barely). 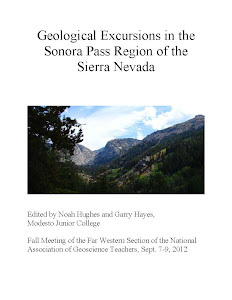 Pomona has one of the finest geology programs in the state, and I readily recommend it to my transferring students. The department has a rich history that extends back into the early 1920s, when it was (I believe) only the second such program to be established in the state. For the first thirty years, the department was headed by A.O. Woodford, a legendary geologist in California circles. He continued as an emeritus professor for decades, and I actually was privileged to attend a field trip that he conducted when he was in his early nineties. He lived to be over 100 years old. The name Russell D. Dysart popped up in my search...he was one of the earliest graduates of the geology department at Pomona College, in 1925, only three years after the program began! He apparently taught at Chaffey Junior College for many years, where (it is noted on the Pomona website) that he was famous for the red tie that he wore on all his field trips. So there you go. My grandfather was a student of one of the first graduates of my alma mater, who taught at the community college that I attended. You never know the connections that will happen in life. 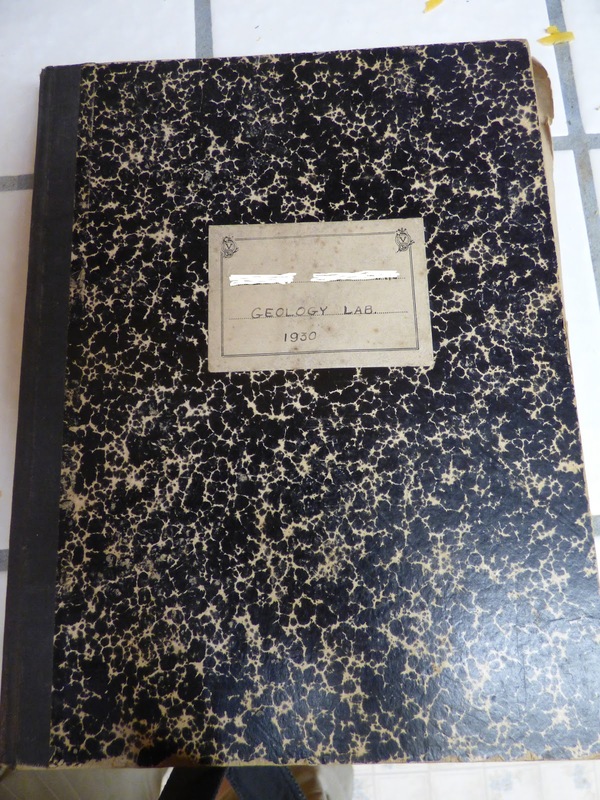 It's a lot of fun to thumb through the history of geology as seen by the student. One can find old textbooks in used book stores (and I have some that date back to the late 1800s), but it is a little different to see how that knowledge filters down to a student who may or may not ever think about geology again (for the record, my grandfather retained a lot of his geologic knowledge and enjoyed picking my brain for years). There isn't a lot of personal perspective in these notes, and I wouldn't expect all that much, but I was struck by my grandfather's penmanship. It's a good thing my students have computers these days to write with, just sayin'. Some things are very different as one scrolls through hypotheses about the origin and history of the Earth, but other things remain the same. We may have an incredible theory, plate tectonics, through which we can understand much of the history of the planet, a theory that had not been accepted, nor even conceived in the 1930s (look up what happened to Alfred Wegener for instance). And yet the rocks and fossils are the same. We've discovered many more species, but the drawings my grandfather made look very much like those that my own students will be drawing in just a few weeks. Complex over-arching theories are great, but they have to explain the rocks and fossils or they will come crashing down. Students will always need to know the basic information in order to understand the theories that account for them. I was taking my near daily walk along the river trail that lies a mile from my house. It winds for two miles along the Tuolumne River where it emerges from the Sierra Nevada foothills and flows into the Great Valley. I'll grant that for a river like the Tuolumne, it's not the grandest bit of scenery. This is a river that begins in the spectacular high country of Yosemite National Park, flows through a little known canyon that is as deep as Arizona's Grand Canyon (actually called the Grand Canyon of the Tuolumne), and then through a network of gorges famous for white-water rafting. Downstream, the river feeds into a floodplain that is part of America's greatest savanna environments, the winter home of hundreds of thousands of migratory birds like Sandhill Cranes, Snow Geese, Cackling Geese, and many, many others. My stretch of river? It's historically been kind of a dumping ground. It was first turned upside down in the search for gold in the 1800s an early 1900s. Much of the riparian habitat was torn out while miners processed millions of cubic yards of sediment. An old dredge still sits abandoned a few miles upstream. In the aftermath, quarry operations removed gravel, altering the streambed and leaving a series of ponds. Invasive plants like hyacinth invaded the river, and noxious invasive weeds invaded the hillsides above. Reservoirs were constructed upstream, siphoning off water and sending it to hundreds of thousands of acres of irrigated farmland downstream. In some ways, the river is a shadow of its former self. The trail follows a bench above the main riverbed, and there are a number of spots where one can clamber down and sit by the river. I have my favorite spot about a mile up the trail, and I was sitting there enjoying the sunset and watching a Kingfisher diving into the water for a meal. It occurred to me, sitting there for maybe the 100th time or so (the trail was opened about two years ago), that this was home. I mean, sure, home is usually a place with walls and a roof and all that, but our homes are also a place beyond the backyard. We may have co-opted almost all the natural places, but there are bits and pieces still present, a place where we can comprehend the nature of the land that we live on. The Tuolumne Parkway Trail is that place for me, a spot that I can explore again and again, always with the possibility of seeing something surprising, something new and unexpected. The other day it was the surprise of discovering that beavers have been living and working not thirty yards from where I sit and watch the river. How in the world could I miss that for two years? It's possible that they recently arrived, given that the entire floodplain was actually flooded for more than six months last year during the record precipitation year. They may be just now reestablishing themselves in the newly changed environment. A bit of research later on resulted in the discovery that this very stretch of river was one of the last stands of the native California Golden Beaver. Some were captured here to establish populations elsewhere in the state (this was in the 1940s). My explorations of the river coincided with the discovery that our county has one of the most diverse bird populations anywhere. More than three hundred species have been recorded here. Many, of course, were rare sightings of vagrants from elsewhere, but birders in the area regularly record more than two hundred species in a year's time. So...I always have my camera with me when I wander the trail. I'm new at this sort of thing, but still I have seen more than eighty species on the river and the adjacent bluffs and pastures. I'm still seeing new ones. Since January 1st, I've seen Pied-billed Grebes (above), a Merlin (below), and a flock of Common Goldeneyes (below the Merlin) for the first time on this stretch of river. I only saw the Merlin once, but the Grebes and the Goldeneyes turn out to have favorite spots to hang out on the river. Now that I know where to look, I can almost always see them, and note whether the flocks have grown larger or not. It's that way with the more common birds too. Many of the birds spend their time near the same trees or shrubs. The Scrub Jays and Yellow-billed Magpies prefer particular trees on the bluffs or near the river. When the swallows arrive in spring, they have their preferred cliffs (and bridges) for their nests. There are several oak trees where I can expect to find colorful songbirds like Hooded Orioles, Bullock's Orioles, Western Tanagers, and Audubon's Warblers in the right season. The Phainopeplas have their favorite trees, as do the egrets, cranes and herons. There have been two American Kestrels that have about four perches that they will abandon, one after another, as I walk forward on the trail (I can't walk the trail without irritating them; I keep hoping they'll finally just recognize me and stop fleeing). It's that way with dozens of individual birds that I see over and over. They're rarer, but I have seen more and more of the larger mammals as well. Early on I photographed a Gray Fox where the stairway sits today, and the picture was eventually added to the interpretive signs for the trail. 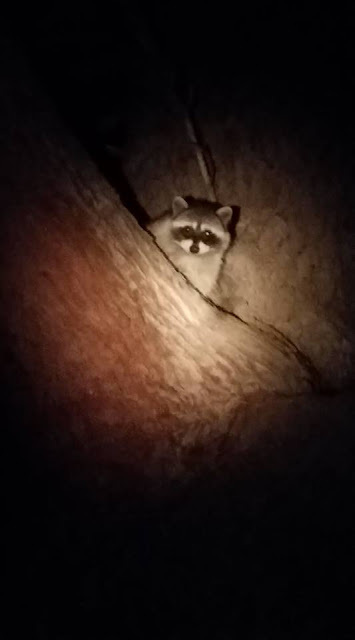 I've seen River Otters three or four times, and Raccoons (one was sleeping in a tree next to the trail just this week). As I sat there this evening I thought of how lucky I've been in my life, the privileges I've been granted in exploring some of the most spectacular places on planet Earth. I treasure my handful of overseas adventures in Australia, Italy, Scotland, England, France and Switzerland, my journeys to the Hawaiian Islands, and especially the adventures I've had with my students across the western states of the U.S. (and Canada, too). I was lucky to see so many spectacular sights, but I also know that I will see many of those places only once, and for only a brief time (the schedules must be adhered to). On the other hand, I have been granted a continuing privilege of getting to know a single place well, learning the rhythms and seasonal changes, being there long enough to take advantage of capturing a fox or otters on video (like the one below). It may not be the most spectacular of scenic places, but it is a small piece of the natural world that still exists just beyond my front door. It's the kind of precious gift that just about anyone can experience. Practically everyone lives relatively close to a river or stream, lake or forest, even in places where such things are not expected. There are some great places to see the natural world in the Los Angeles Basin, for instance. They're worth seeking out. It is a great adventure to learn something new, and to have the potential for making discoveries every time one ventures out beyond their doorstep. It's a cheap thrill, so to speak, since one really doesn't need money to visit many of these places. I encourage you to seek out those small wild places close to home. They have their very own kind of grandeur, even if the tour guides and brochures would never send you to there. It's the grandness of the home places. What is your place? I live in an extraordinary place, a place that does not always receive the respect that it deserves. In much the same way that travelers refer to the Midwest as "fly-over states", my home is the "drive-through valley". The Great Valley (called by some the Central Valley) is a 400 mile long and 50 mile wide province that must be traversed by Southern Californians who want to reach the Pacific Northwest, or coastal Californians who want to reach Yosemite National Park or the Sierra Nevada ski resorts. San Luis National Wildlife Refuge from above. It lies on the floodplain of the San Joaquin River. Many people find the journey an arduous exercise in white-line fever, an endless flat region covered by millions of acres of orchards and fields of crops, or cattle stockyards, or used car lots on the edges of poor-looking towns. I'm willing to grant that it is often not a pretty sight. There is a reason that our cities often wind up last on the lists of "best places to live". Our skies are often the most polluted in the United States. In the thirty years that I've lived here, I've come to discover a different Great Valley. It's the five percent of the valley that still retains the character of the land that existed before it was co-opted by agricultural development. It's a recurrent theme of my blogging adventures because each of these adventures expands my world just a little bit. Today's journey was the auto-tour through the San Luis National Wildlife Refuge. The refuges range the length of the valley, providing winter sanctuary for migrating birds, but also providing a last stand for many native species of the valley from the smallest of bugs to the rodents and larger grazing animals to the largest remaining predators, the eagles, the hawks, the coyotes and foxes, and sometimes even mountain lions. The gigantic herds of Tule Elk and Bison have been gone for more than a century, although the elk are protected as a species in some of the refuges, including 60 of them at San Luis. Without the millions of grazing animals, the refuge managers allow limited grazing of the prairie by sheep and cattle to maintain the integrity of the grasslands. I imagined the scene above as a wolf patrolling the margins of a giant herd grazing elk, looking for a weak or sick individual to take down. The reality was the opposite, of course. The dog was watching over the sheep. I don't see them often, but Mule Deer do inhabit the grasslands. We saw nearly a dozen of them today. I've mostly given up on trying to take decent pictures, but I really liked this one. The stars of the refuge are the myriads of bird species that call them home. Some of them only stay for a few days or a few months as part of a long migration, while others stay year-round. Each refuge includes a wide range of habitats, including freshwater marshes, riparian areas (river channels), prairie grasslands, and alkali salt flats. The auto-tours at the refuge sample most of these environments, and several hiking trails are available as well. In the first five miles of the tour we didn't see a great many migrant species, so I thought the Cinnamon Teal (above) and the Great Blue Heron (opening photo) that greeted us at the entrance to the refuge were going to be the avian stars of the day. But then we made the turn towards the Souza Marsh at the southeastern edge of the refuge. And everything changed in a moment. We had found the migrants. There were hundreds of Snow Geese, Greater White-fronted Geese, Northern Shovelers, Cinnamon Teals, Northern Pintails, Mallards, American Coots, Pied-billed Grebes, and to our great delight, several dozen Tundra Swans (I count five of the species in this picture alone). The swans aren't rare, but Mrs. Geotripper and I have only found them once before on our travels. They dwarf the other birds in the marsh. Last year was a good year for rain, and water was plentiful after five years of drought. Most of the marshlands were flooded, providing better than normal habitat for the birds. Unfortunately, the new year is proving much drier, with a near record low snowpack in the mountains upstream, and dry conditions in the long-range forecasts. Uncertainty lies ahead. 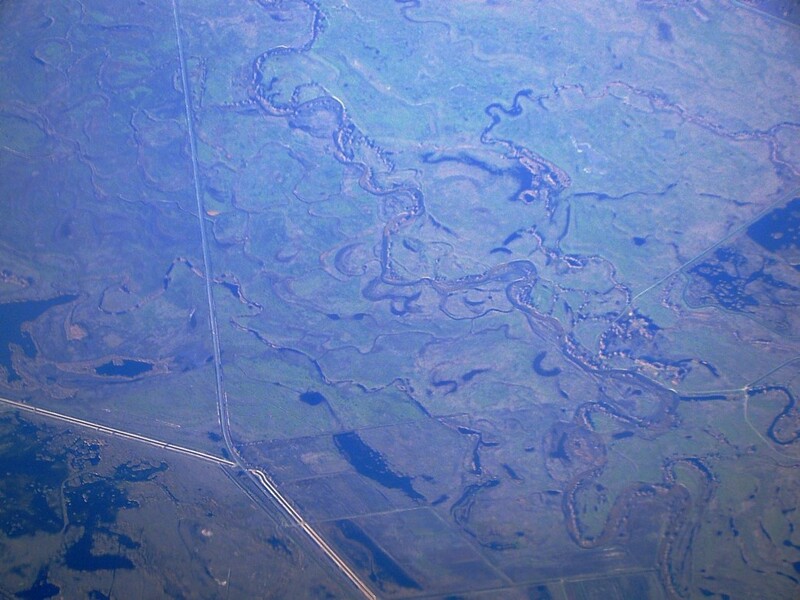 The prairies and river environments have always existed in a cycle of drought and flood. The biggest variable in the present day and in the future is the effect of global warming on the environment here. The predictions are for more drought, although some climate models suggest more rain in some years. Unfortunately that means less snow, and more variable river flows, heavier in the spring, and far less in the summer and fall. It's hard to predict the coming changes in the ecosystem that will follow. That ecosystem of course includes the species Homo sapiens, who despite their arrogance about "ruling over nature" and all that, are just as vulnerable to climate change as the rest of the species who live here. Their one advantage is the ability to recognize the situation they are in, to provide reasonably accurate predictions about the future, and the ability to affect the outcome.